Before I started the blog, Mark and I painted our cream front door a nice greyish navy called Hale Navy by Benjamin Moore. It turns out it’s a very popular color, but we chose it simply by holding up one of Mark’s favorite T-shirts to the color wheel and finding the closest match. We love to color and painted our outdoor shutters to match. The navy color allows for lots of fun wreath options. 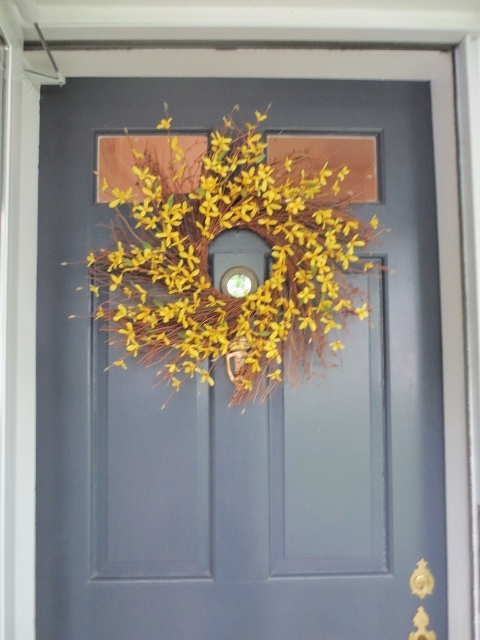 This spring I have had this pretty yellow forsythia wreath. In the fall and winter, red looks great as well. 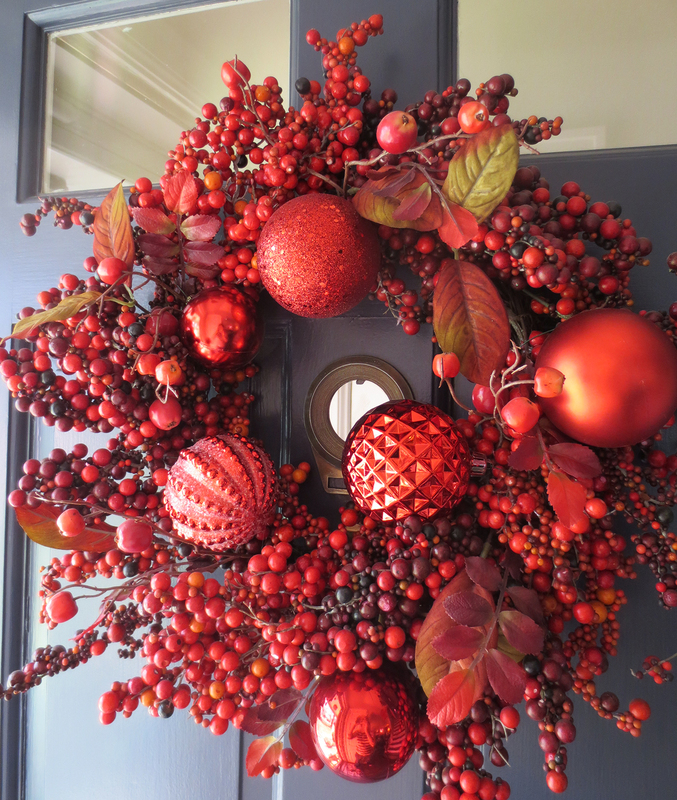 Here’s my holiday wreath from last year. I’ve never had just the right thing for summer however, so this year I decided to go where no woman has gone before. Just kidding, I decided to be like everyone else and DIY a burlap wreath. Seriously, I hate to even post a picture of it because I think Pinterest might explode if someone pins one more burlap wreath, but here we go. Cute right? I was amazed at how easy it was. I am really not a crafter, but after watching some video instructions, it seemed easy enough and it was. Here’s how I did it. I went to Michael’s (armed with coupons, of course!) 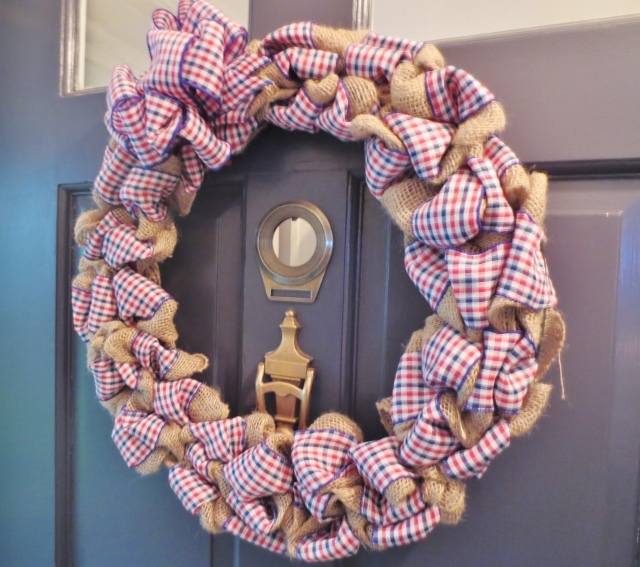 and bought 1 metal wreath “loom” in the appropriate size; 1 10 yard roll of burlap ribbon/fabric, and 1 10 ft. roll of red, white and blue gingham ribbon. Does anyone see a problem? 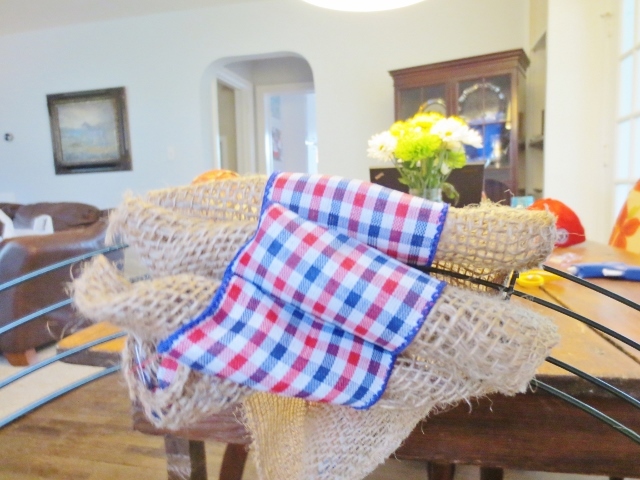 I bought 10 yards of burlap, but only 10 feet of red, white and blue ribbon. Math man, math. Anyway, I didn’t actually figure this out until later in the process when I was out of ribbon, but not burlap. So let’s proceed for now. 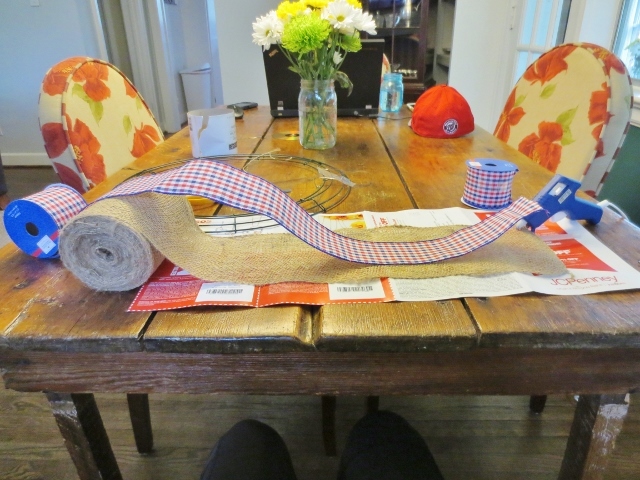 From the beginning my vision was to find a nice patriotic ribbon that was about 2/3 of the width of the burlap which was 5″ wide. I was thrilled to find this pretty gingham style in just the width I wanted. I also think the gingham combined with the burlap gives off just the amount of “country chic” that I was going for. I got out my glue gun and started gluing the ribbon right in the middle of the burlap. I put down some newspaper underneath where I was working so that I wouldn’t get any glue that seeped through the burlap on my table. It didn’t take more than 20 minutes to do this. When I got to the end of my ribbon and discovered that I still had about a quarter of my burlap left to go, I realized my math mistake and ran back to Michael’s for another spool. 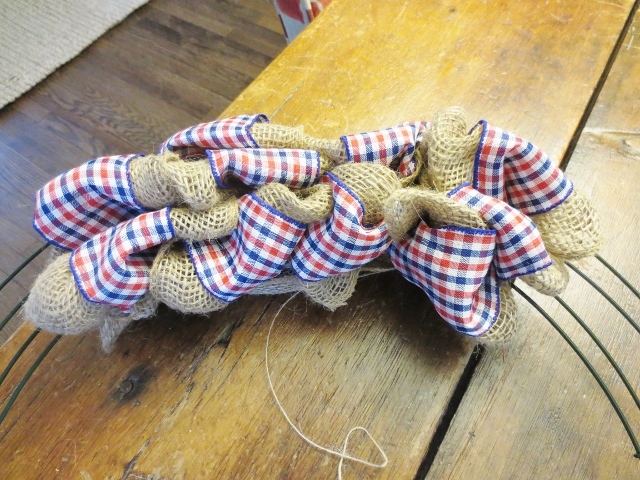 Once the ribbon was glued to the burlap, I started the wreath. There are lots of good videos and tutorials online and I can’t find the exact video that I used anymore, but basically here’s what you do. 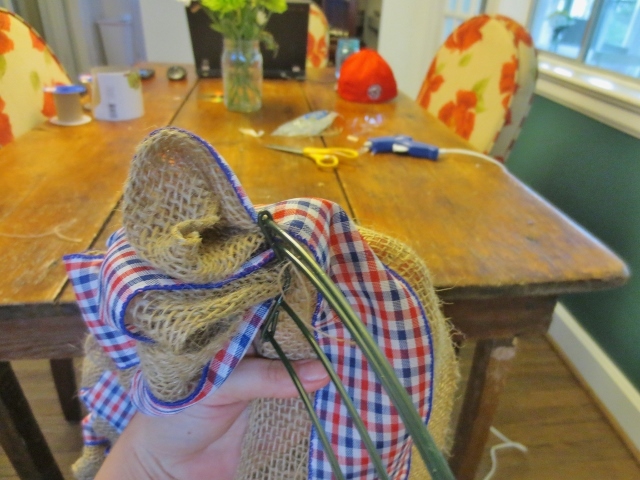 Start by using a pipe cleaner to attached one end of the burlap to the wreath. I made a heart with the burlap and strung the pipe cleaner through the middle. Then I wrapped the ends of the pipe cleaner around the wreath. The video I watched tells you to wrap the burlap through the three rings like this. After weaving the burlap through one time, I realized an issue. 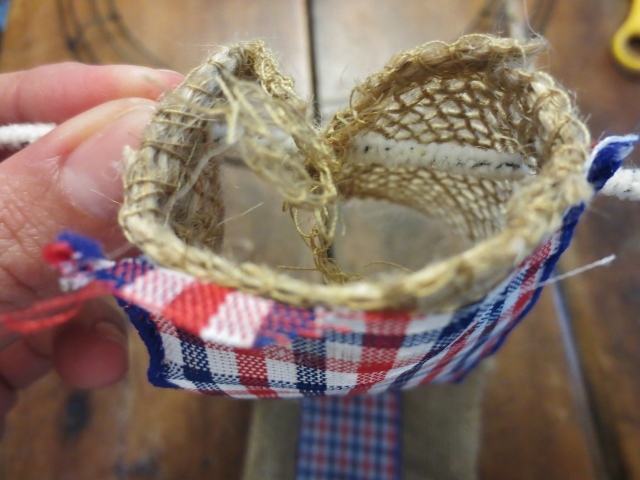 Since I had glued the ribbon to only one side of the burlap, I couldn’t just weave it through the three layers of wire going forward because that would mean that half of burlap showing would be the “back” half without the ribbon. Bummer. 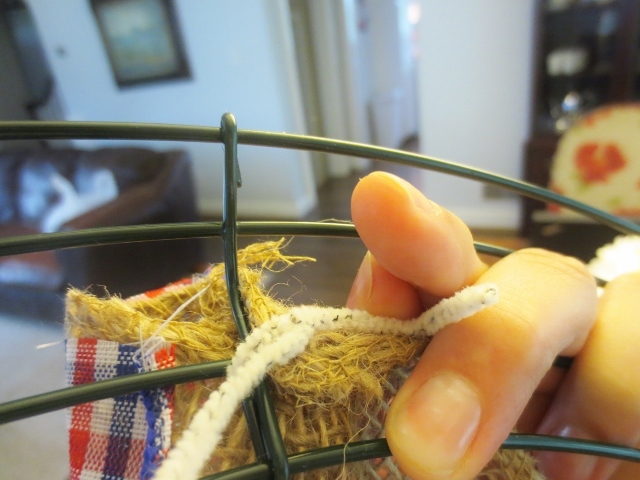 I sat there and fussed with it for a while and realized that I could twist the burlap on the back side of the wreath before pulling it through where necessary and that would allow the front side of the burlap to always be on the front side of the wreath. This also made the wreath a little more “curly” than the example in the video and I liked the way that it looked. It didn’t take more than 20 minutes to go all the way around. The 10 yards of burlap was just the right amount and I used the extra ribbon to create the bow. All told, I probably spent about $20 and 1 hour on this project (not including trips to the store.) Pretty easy on both the wallet and the clock. You could definitely embellish more with some painted stars and/or flags or by adding a wood letter/monogram in the middle, but I tend to like simple things and decided to live it with as is this year and then maybe add to it next year. 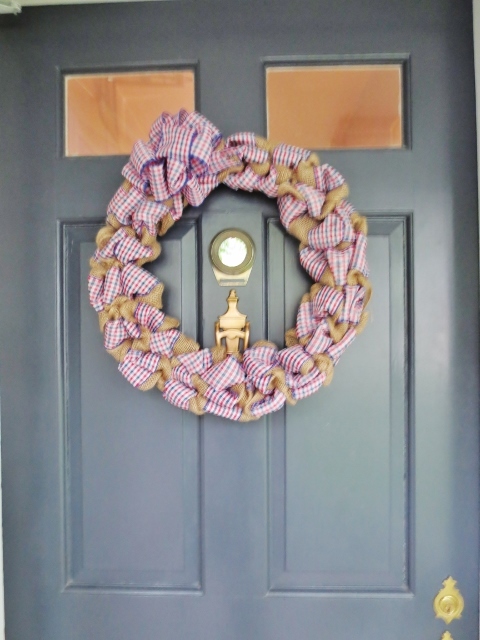 Between this wreath and our Hale Navy door, I would say that we are more than ready for Memorial Day. I hope everyone has a nice weekend. We don’t have alot planned for once, which is nice. Love the look! Happy Memorial Day! Oh my gosh, I love that color. The combination of gray and navy is great, very classy. I saw a post you made in Younghouselove.com where you mentioned that you, too, are from NoVa, so I followed your link here. Very nice blog! Keep up the good work! I look forward to visiting again! Did you know that John Petersik is from Burke? We live in the same area, and have been here for about 22 years, and then before that I grew up here.